Preparing for the arrival of a new baby can be scary! Not only do you have to pick a baby name, prepare the nursery, and have multiple doctor visits, you also have to make sure you’re financially prepared for the arrival of your newborn baby. I remember when Angie and I had our first child. It was a really joyous time for us. But it was also daunting because it was new territory that we had never experienced before. We had to make sure we had enough baby clothes, diapers, and other supplies. We had to agree on a name for the baby (it was Trevor by the way), pick out a crib, and most of all, make sure we had enough money to raise our new child going forward. All those details can be stressful! Of course, with a little planning it all worked out in the end. Our oldest is now in college and more expensive than ever! Some of those plans we made over 20 years ago are still working to our advantage today! So I thought I’d share with you some of the things we did (and wish we had done) to prepare for having our first child. 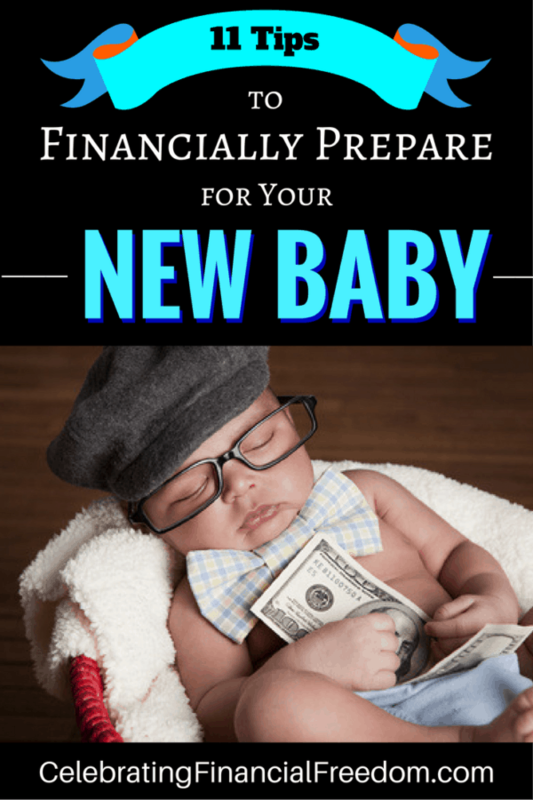 If you’re a new parent or plan on becoming one soon, this article will help you be as financially prepared as you possibly can for your new baby! The USDA estimates the cost of raising a child to age 18 is $245,340. Don’t let that freak you out! It’s a long haul to raise a child to adulthood, and you can save a lot of money at it if you’re diligent enough. Here are some of the things to consider before and after your beautiful newborn arrives. Preparing for your infant to arrive means you have to make a lot of decisions. Some of the best help you can get with those decisions will come from experienced moms and dads. Parents with multiple kids will be especially helpful. They will help you cut through the fluff and make the most practical decisions for you and your newborn baby. This list is not exhaustive, but it does highlight some of the most common decisions you’ll need to make before your new baby arrives. There’s no wrong way to go here. Each diaper has its advantages and disadvantages. Startup cost is around $800. However, you’ll save a lot of money over disposables in time. They are more environmentally friendly than disposable diapers. Cloth diapers take more time and effort to deal with because they have to be cleaned. Choosing a cloth diaper service costs about as much as using disposable diapers. Are more convenient, no cleaning necessary. Cost more in the long run ($2,000-$3,000 for two years). They end up in landfills and are not good for the environment. I definitely won’t get into the breastfeeding vs. formula debate to feed your newborn infant. There are plenty of time, health, and cost factors to take into account. For this article I’m just going to focus on the costs and time involved. You’ll probably need a breast pump, which can cost from around $20 up to $200 or more. You will probably need a few bottles for those times when you have to pump (cost $20-30). You’ll need accessories such as nursing bras, nursing pads, etc. (cost = $100). Mom will need more time to be available for the baby, so having a job might be difficult until your new baby can eat solid food. According to this post, using formula to feed your new baby can cost over $1,700 per year. You’ll probably need more bottles than if you breastfeed (cost= $40-$50). Anyone can feed the baby, so you’ll have more time available to work if you choose. Overall, breastfeeding usually ends up being much cheaper than formula. But the decision of whether or not to breastfeed is not always based on the financial benefits. Do the research and make the choice that’s best for your family. There are a lot of basics you’ll need for the baby such as clothes, a stroller, a crib, and various accessories. It’s way too easy to get caught up in the excitement and overspend on things you really can’t afford. You’ll need a crib. But you may want a fancy $1,000 crib with all the bells and whistles. Resist the urge. A stroller is a necessity, but you don’t have to buy the best one on the market. Everybody wants cute clothes for their baby. That doesn’t mean you have to outfit them at the fashionable (and pricy!) baby boutique. Be careful about over-decorating the nursery. Custom murals and high end furniture are great, but your newborn will never know the difference. Of course, there’s nothing wrong with buying top of the line items for the baby (as long as you can afford it). But if you have to go into debt and spend money you don’t have because you want fancy stuff, you might need to reevaluate. When our kids were little, most of their clothes were given to us by others or bought at consignment sales and Goodwill. Even though we could afford brand new, we got plenty of nice clothes for next to nothing! There is nothing wrong with hand me down clothing or used baby furniture. Baby will look just as cute with used stuff (and you’ll save a lot of money to boot!). The earlier you start saving for college the better. One of the best things you can bless your child with is a paid for college education. Not only does it help you when they go off to school, it affects your child’s adult years, and even your grandchildren. Just think how much better their life can be if your child doesn’t have to spend 10-20 years paying off student loans! Start automatically depositing $50-100/month into a 529 Plan or Education Savings Account (ESA). By the time they reach college you won’t have to struggle to pay their tuition! If you generate an income, get a term life insurance policy for at least 10-15x your yearly salary. If you are a stay at home parent, get a term life policy for the amount it would take to pay for things like child care, transportation and anything else you provide that will have to be paid for in your absence. There is no need to get life insurance on your child. It’s generally a waste of money. Health insurance is extremely important- Especially when you’re expecting a new baby. Make sure you know what your insurance will (and won’t) cover when your child is born so there are no financial surprises. Here’s an interesting alternative to health insurance you might find interesting. Having a child brings tax advantages that you’ve never had before! When you fill out your taxes after your child is born, you will get a $1,000 tax credit every single year up to age 17. Also, depending on your income, you can receive a tax credit of up to $1,050 to defray the cost of childcare expenses. You can take that tax credit every year until age 13. Most people don’t think about getting disability insurance, but it’s a necessity. What if you get injured and can’t provide a living for your family? It happens a lot more often than you might think, and can be financially devastating when you have no way to protect your income. Don’t forget to slow down and enjoy the process! Anticipating the arrival of a new baby forces you think about a lot of things in your life you’ve never had to think about before. It can get a little overwhelming if you let it! But when it comes down to it, becoming a new parent is one of the most fulfilling and important things you can do in life. Doing what you can to be prepared for that little bundle of joy will only make the experience that much better! So don’t let it stress you out too much! Focus on what’s important and everything else will fall into place! Question: Are you a new parent or will be soon? Leave a comment on our Facebook page or below and tell me your biggest concerns with starting a new family.